Thirty-nine cent packages of instant udon are a great thing to have around. 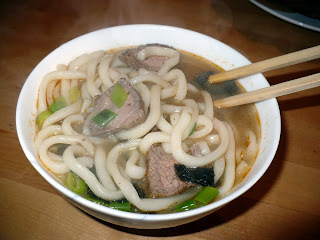 For this quick meal, I simply made a quick miso soup, then added the instant udon and sliced of leftover grilled tri-tip. This week I seem to be reinventing leftovers all over the place.